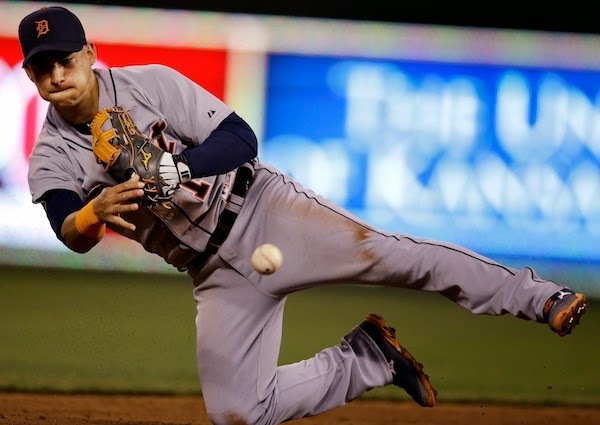 Jose Iglesias is a human highlight reel, no one questions that — when he's in the lineup, at least. It's a good thing for Anibal Sanchez that the defensive wizard was on his game early in Thursday's contest against the Minnesota Twins, after briefly looking like he wouldn't be earlier in the day, thanks to a lineup snafu. Iglesias turned a slick double play in the first inning, using his glove to flip the ball from behind second base to Ian Kinsler at the bag, forcing out Minnesota's Brian Dozier. It helped that Kinsler barehanded the flip, and whizzed the ball to first base to complete the literally figurative Twin killing.